Requires x2 AA Batteries (Not Included). 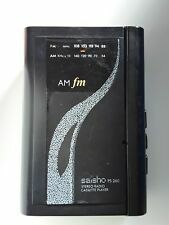 Saisho PS 250 Personal Cassette Radio Player - 1980s. Looks like new. Don’t think it’s ever been used or if it has then not a lot. NO HEADPHONES PLAYER ONLY. RUNS OFF TWO AA BATTERIES (NOT INCLUDED). This player has been tested and is in perfect working order. It powers up, and cassettes and radio play. As such, sold as pictured for spares/repairs. Plugs in to a headphone socket. Colour of Player is black, even though one pictured on box is white. 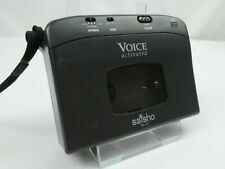 In excellent condition, though something is wrong and it doesn't work . Cosmetically great condition, player and headphones. Includes instructions and box, box has some wear see photos. Please see my feedback and other listings.